I have decreed it because men in kits are just HOT. I acn only imagine what Al Gore looks like in a kilt, but I am sure its really really HOT LOL. This is the piper that played at my sister in law's weddding in Canada last year. I dont remember his name. Thats his wife, arent they a good looking couple?? My mom is better today but she is still in the hospital. Dad is kinda pitiful, he complains about her but right now he is missing her. My mom has never been sick and never really been in the hospital so she not a good patient. Me, I am a model patient, LOL the nurses love me. Lord knows I have had enough practice. I had to get blood work done yesterday and the vampires were having a busy day! I had to wait, usually I can just go in and get it done. I had a winning streak going on the blog battles and maybe I got too cocky because now I am on a major losing streak. But still I cant stop, I seem to be addicted. Oh I went and bought some banana stix last night, all is right with the world. I bought 2 boxes of banana stix and a pack of smokes for hubby. I think the checkout boy was giving me strange looks about my purchases but I dont care beacuse I have 23 banana pops in my freezer (it was 24 but I ate one last night) and I can face anything now! 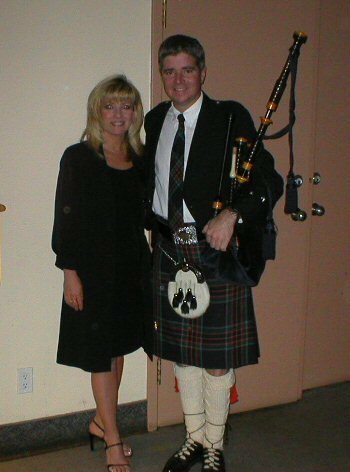 I love men in kilts! Hope you win this battle! Glad you got your banana stix! You should have bought a whole case of them! Men in kilts as a turn-on...that's a new one for me. I guess I just like pants way too much. that's funny we call them banana fudgesicles. I love men in kilts too I just wonder what they wear under there cuz I have heard it's NOTHING!!! Hey Mel. I hope your mom is doing ok.
LOL,I'm glad you got your sticks! Thinking of your Mom, hope she gets better soon Mel. Well just bless your heart gal...you seem to be having a time of it. I'll keep a good thought for you, as they say on TV. Since I have Scot blood in my background, I could probably legally wear one...hmmmm...nah! Glad you found your Banana stix! find banana stix so I know what Mel is talking about! Wow! What a CUTE couple!!! Nice knees, too (um, not that I was "looking", of course)..